This isn’t a joke—there really is an envelope-controlled flanger hidden inside Melodyne Essential that sounds particularly good with drums, but also works well with program material. The flanging is not your basic, boring “whoosh-whoosh-whoosh” LFO-driven flanging, but follows the amplitude envelope of the track being flanged. 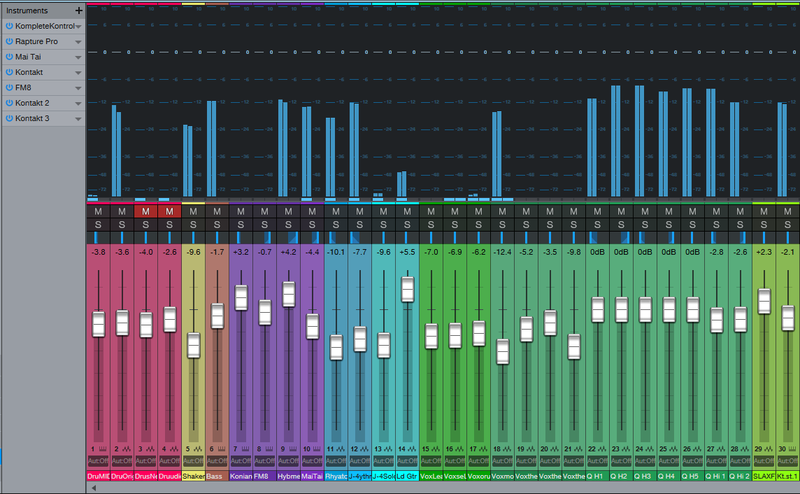 It’s all done with Melodyne Essential, although of course you can also do this with more advanced Melodyne versions. Here’s how simple it is to do envelope-followed flanging in Studio One. Duplicate the track or Event you want to flange. In Melodyne, under Algorithm, choose Percussive and let Melodyne re-detect the pitches. “Select all” in Melodyne so that all the blobs are red, then start playback. Click in the “Pitch deviation (in cents) of selected note” field. Drag up or down a few cents to introduce flanging. I tend to like dragging down about -14 cents. As with any flanging effect, you can regulate the mix of the flanged and dry sounds by altering the balance of the two tracks. Note that altering the Pitch Deviation parameter indicates an offset from the current Pitch Deviation, not an absolute value. For example if you drag down to -10 cents, release the mouse button, and click on the parameter again, the display will show 0 instead of -10. So if you drag up by +4 cents, the pitch deviation will now be at -6 cents, not +4. If you get too lost, just select all the blobs, choose the Percussion algorithm again, and Melodyne will set everything back to 0 cents after re-detecting the blobs. And of course, I don’t expect you to believe that something this seemingly odd actually works, so check out the audio example. The first part is envelope-flanged drums, and the second part applies envelope flanging to program material from my [shameless plug] Joie de Vivre album. So next time you need envelope-controlled flanging, don’t reach for a stompbox—edit with Melodyne. The previous tip on creating a dual-band reverb generated a fair amount of interest, so let’s do one more reverb-oriented tip before moving on to another topic. Studio One has three different reverbs—Mixverb, Room Reverb, and OpenAIR—all of which have different attributes and personalities. I particularly like the Room Reverb for its sophisticated early reflections engine, and the OpenAIR’s wide selection of decay impulses (as well as the ability to load custom impulses I’ve made). Until now, it never occurred to me how easy it is to create a “hybrid” reverb with the best of both worlds: using the Room Reverb solely as an early reflections engine, and the OpenAIR solely for the reverb decay. To review, reverb is a continuum—it starts with silence during the pre-delay phase when the sound first travels to hit a room’s surfaces, then morphs into early reflections as these sounds bounce around and create echoes, and finally, transforms into the reverb decay—the most complex component. Each one of these components affects the sound differently. In Studio One, these components don’t all have to be from the same reverb. 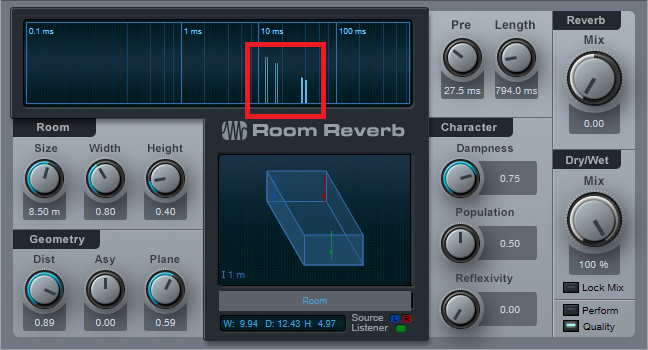 Start by inserting the Room Reverb into an FX Channel, and calling up the Default preset. Then set the Reverb Mix to 0.00 and the Dry/Wet Mix to 100%. The early reflections appear as discrete vertical lines. They’re outlined in red in the screen shot below. 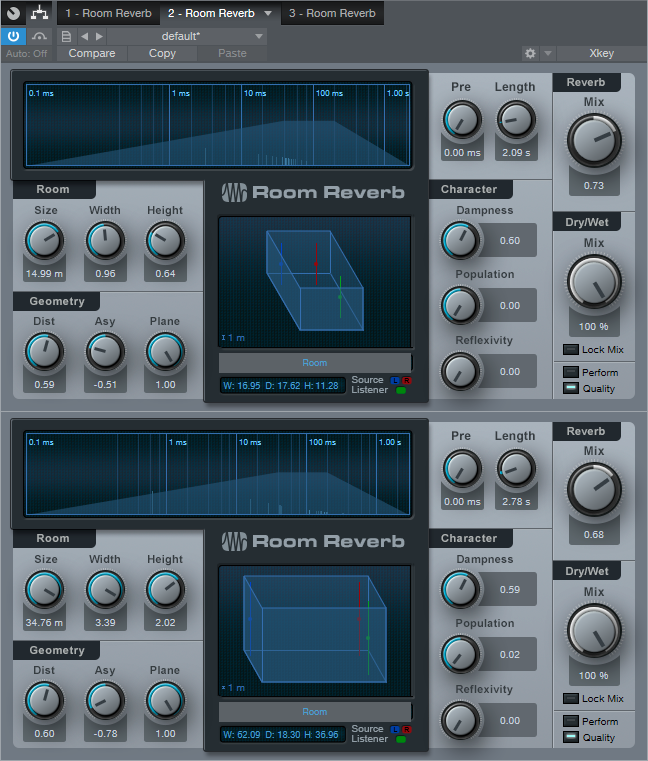 If you haven’t experimented with using the Room Reverb as a reflections engine, before proceeding now would be a good time to use the following evaluation procedure and familiarize yourself with its talents. From the Browser, load the loop Crowish Acoustic Chorus 1.wav (Loops > Rock > Drums > Acoustic) into a stereo track. This loop is excellent for showcasing the effects of early reflections. Create a pre-fader send from this track to the FX Channel with the Room Reverb, and bring the drum channel fader all the way down for now so you hear only the effects of the Room Reverb. Let’s look at the Room parameters. Vary the Size parameter. The bigger the room, the further away the reflections, and the quieter they are. Set the Size to around 3.00. Vary Height. Note how at maximum height, the sound is more open; at minimum height, the sound is more constricted. Leave Height around 1.00. Now vary Width. With narrower widths, you can really hear that the early reflections are discrete echoes. As you increase width, the reflections blend together more. Leave Width around 2.00. The Geometry controls might as well be called the “stand here” controls. Turning up Distance moves you further away from the sound source. Asy varies your position in the left-right direction within the room. Plane is a fairly subtle effect. To hear what it does, repeat steps 3 and 4, and then set Size to around 3.00, Dist to 0.10, and Asy to 1.00. Plane spreads the sounds a bit more apart at the maximum setting. Now that you know how to set up different early reflections sounds, let’s create the other half of our hybrid reverb. To provide the reverb decay, insert the OpenAIR reverb after the Room Reverb. Whenever you call up a new OpenAIR preset, do the following. Set Predelay to minimum (-150.00 ms). Initially set Envelope Fade-in and Envelope ER/LR-Xover to 0.00 ms. There are two ways to make a space for the early reflections so that they occur before the reverb tail: set an Envelope Fade-in time, an Envelope ER/LR-Xover time, or both. Because the ER/LR control is set to 1.00 there are no early reflections in the Open AIR preset, so if you set the ER/LR-Xover time to (for example) 25 ms, that basically acts like a 25 ms pre-delay for the reverb decay. This opens up a space for you to hear the early reflections before the reverb decay kicks in. If you prefer a smoother transition into the decay, increase the Envelope Fade-in time, or combine it with some ER/LR-Xover time to create a pre-delay along with a fade-in. The OpenAIR Mix control sets the balance of the early reflections contributed by the Room Reverb and the longer decay tail contributed by the OpenAIR reverb. Choose 0% for reflections only, 100% for decay only. There are other advantages of the hybrid reverb approach. In the OpenAIR, you can include its early reflections to supplement the ones contributed by the Room Reverb. When you call up a new preset, instead of setting the ER/LR, Predelay, Envelope Fade-In, and Envelope ER/LR-Xover to the defaults mentioned above, bypass the Room Reverb and set the Open AIR’s early reflections as desired. 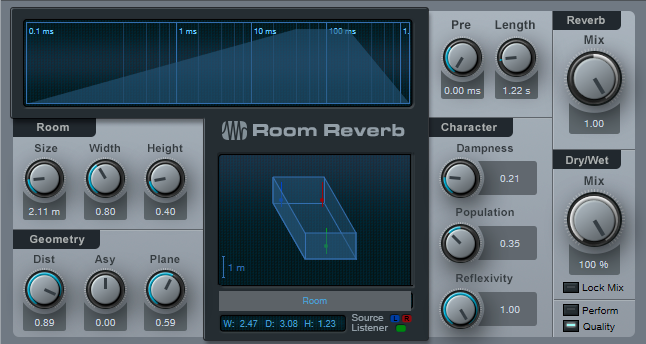 Then, enable the Room Reverb to add its early reflections, and tweak as necessary. It does take a little effort to edit your sound to perfection, so save it as an FX Chain and you’ll have it any time you want it. It’s convenient that Studio One has three significantly different reverbs, but none of them has separate decay times for high and low frequencies. This is one of my favorite reverb features, because (for example) you can have a tight kick ambiance, but let the hats and cymbals fade out in a diaphanous haze…or have a huge kick that sounds like it was recorded in a gothic castle, with tight snare and cymbals on top. Also with highly percussive drums, sometimes I’d like a little more diffusion than what’s available so that reflections aren’t perceived as discrete echoes, but rather, as a smooth wash of sound. So let’s build the ideal Room Reverb for drums (other instruments, too). There’s a downloadable FX Chain that provides a big drum sound template, but note that the preset control settings cover only one sound out of a cornucopia of possible effects. Once you start modifying the reverb sounds themselves, as well as some of the parameters in the Routing window itself, anything’s possible. Here’s the FX Chain routing. Splitter 2 provides a Normal split. One split handles the dry signal, while the other goes to the reverbs. 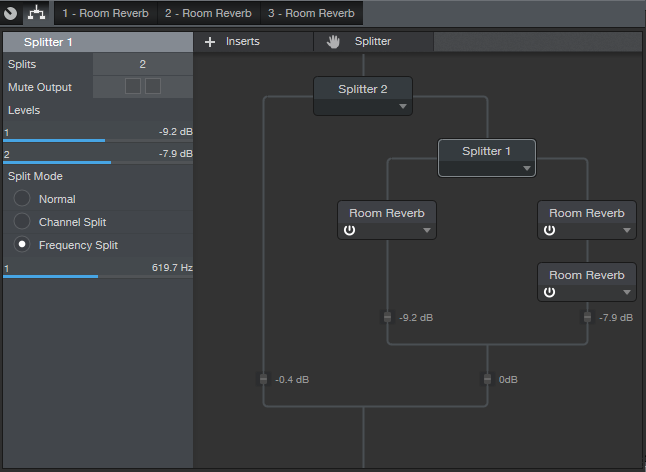 Splitter 1 does a Frequency split, with one split going to a single Room Reverb dedicated to the low frequencies, and the other split going to two Room Reverbs in series for the high frequencies. The Split point (crossover frequency) is set around 620 Hz, but varying this parameter provides a wide variety of sounds. You might wonder “why not just feed two reverbs, and EQ their output?” EQing before going into the reverb gives each reverb more clarity, because the low and high frequencies don’t interact with each other in the process of being reverberated. The three Mixtool modules provide mixing for the dry, low reverb, and high reverb sounds, as represented by the first three Macro controls. The other controls modify reverb parameters, but of course, these are only some of the editable parameters available for adjustment within the Room Reverb. Here’s one option, although I don’t claim that it’s necessarily “best practices” (suggestions are welcome in the Comments section!). Start with the Dry, Low Verb, and High Verb controls at minimum. Bring up the Low Verb, and adjust Low Verb Balance and Low Decay for desired low end. Then turn down Low Verb, bring up High Verb, and adjust its associated controls (Hi Verb Balance, Hi Verb Decay, and Hi Verb Damping). With both Low Verb and High Verb set more or less the same, go into the Routing section and vary Splitter 1’s crossover frequency (the slider below Frequency Split). After finding the optimum crossover point, re-tweak the mix if necessary. Finally, choose a balance of all three levels, and you’re good to go. WHAT ABOUT THE REVERBS THEMSELVES? For the default FX Chain preset, the Low Verb has a shorter delay than the High Verbs, but still gives a big kick sound. The reason for using two Room Reverbs in series for the high reverb component is to increase the amount of diffusion, and provide a smoother sound. You want fairly different settings for the two reverbs so that they blend, thus giving the feel of more diffusion. There’s not really a lot of thought behind the above settings; I just copied one of the reverbs and changed a few parameters until the sound was smooth. Incidentally, three Room Reverbs requires a decent amount of CPU, so there are switches at the bottom of the Macro Controls to enable the “eco” mode for each reverb. Choosing eco for the low frequency reverb impacts the sound less than choosing eco for the two high frequency reverbs. Download the FX Chain and check out what this FX Chain can do—I think you’ll find that when it comes to reverbs, third time’s a charm. 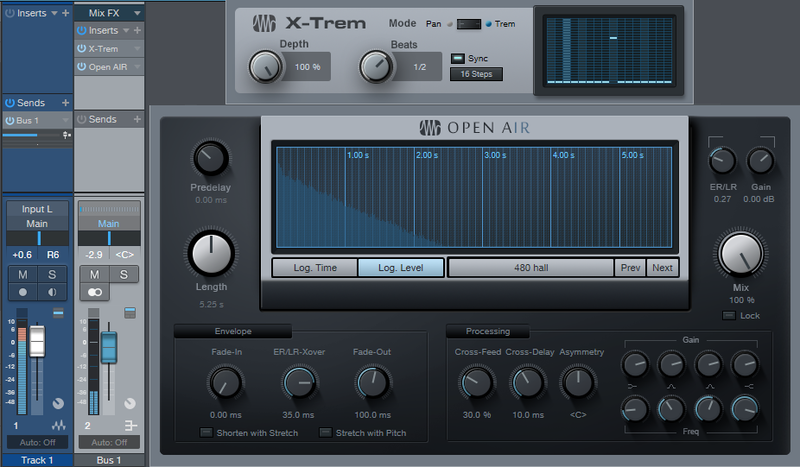 Click here to get the FX Chain preset! A more natural-sounding solution is to edit the vocal to a consistent level first, before applying any compression or limiting, by using phrase-by-phrase gain changes that even out variations. The advantage of adjusting each phrase’s level for consistency is that you haven’t added any of the artifacts associated with compression, or interfered with a phrase’s inherent dynamics. Furthermore if you do add compression or limiting while mixing, you won’t need to use as much as you normally would to obtain the same perceived volume and intimacy. A side benefit of phrase-by-phase normalization is that you can define an event that starts just after an inhale, so the inhale isn’t brought up with the rest of the phrase. Ready to tweak that vocal to perfection? Let’s go. Open the vocal event in the Edit view, and open the Audio Bend view. You can now close the Audio Bend view if you want more room for the waveform height. Choose the Bend tool, and click at the beginning of each phrase to add a Bend Marker. If a section that needs to be adjusted starts in the middle of a phrase, you can add a Bend Marker before the section that needs tweaking anyway, even if there isn’t silence (we’ll explain why later). Once you’ve separated the phrases with Bend Markers, select the event in the Edit view by clicking on it with the Arrow tool. Then, choose Action > Split at Bend Markers. Now each phrase is its own event. Click on an event, and then adjust the gain so the event reaches the desired level. Do this with each event that needs tweaking—done! Note that if audio continues before and after the Bend Marker so the Bend Marker can’t land on silence, Studio One generally handles this well if you place the Bend Marker on a zero-crossing. But if an abrupt level change causes a click at a transition, simply crossfade over it by dragging the end of one event and the beginning of the next event over the transition, and type X to create a crossfade. Adjust the curve for the most natural sound. In extreme cases, fading out just before the click and fading in just after the click can solve any issues. So why not just do this kind of operation in the Arrange View? Several reasons. First of all, the Edit view is a more comfortable editing environment. But also, sometimes detecting transients will place the Bend Markers accurately enough that all you need to do is split and change levels—it’s much easier than doing a series of splits in the Arrange view. And if you count keystrokes, clicking to drop Bend Markers that define where to split and doing all the splits at once is easier than clicking and splitting at each split. Finally, while in Edit view, you can take advantage of the Bend Markers to adjust phrasing. While this is a highly effective technique (especially for narration), be careful not to get so involved in this process that you start normalizing, say, individual words. Within any given phrase there will be some dynamics that you’ll want to retain—never lose the human element. As the quest for expressive electronic instruments continues, many virtual instruments incorporate keyswitching to provide different articulations. 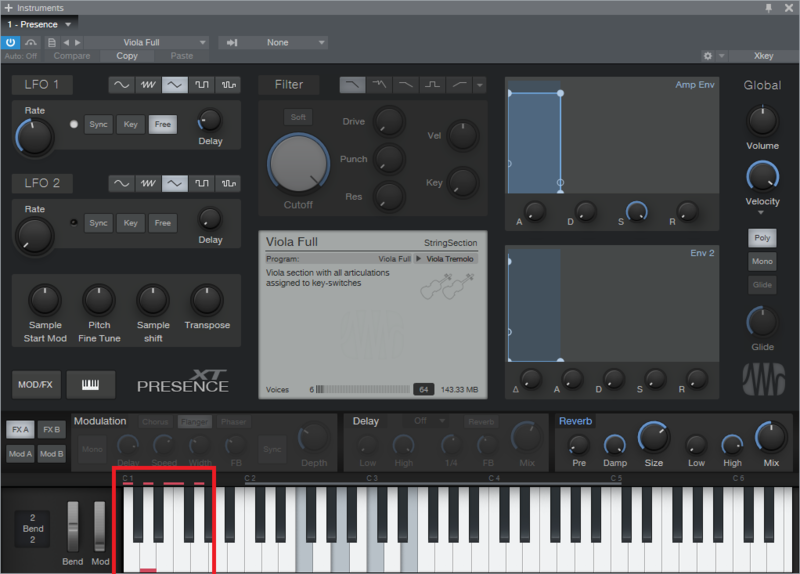 A keyswitch doesn’t play an actual note, but alters what you’re playing in some manner—for example, Presence’s Viola preset dedicates the lowest five white keys (Fig. 1) to articulations like pizzicato, tremolo, and martelé. Fig. 1: The five lowest white keys, outlined in red, are keyswitches that provide articulation options. A small red bar along the bottom of the key indicates which keyswitch is active. This is very helpful—as long as you have a keyboard with enough keys. Articulations typically are on the lowest keys, so if you have a 49-key keyboard (or even a 61-note keyboard) and want to play over its full range (or use something like a two-octave keyboard for mobile applications), the only way to add articulations are as overdubs. Since the point of articulations is to allow for spontaneous expressiveness, this isn’t the best solution. An 88-note keyboard is ideal, but it may not fit in your budget, and it also might not fit physically in your studio. Fortunately, there’s a convenient alternative: a mini-keyboard like the Korg nanoKEY2 or Akai LPK25. These typically have a street price around $60-$70, so they won’t make too big a dent in your wallet. You really don’t care about the feel or action, because all you want is switches. Regarding setup, just make sure that both your main keyboard and the mini-keyboard are set up under External Devices—this “just works” because the instrument will listen to whatever controllers are sending in data via USB (note that keyboards with 5-pin DIN MIDI connectors require a way to merge the two outputs into a single data stream, or merging capabilities within the MIDI interface you’re using). You’ll need to drop the mini-keyboard down a few octaves to reach the keyswitch range, but aside from that, you’re covered. 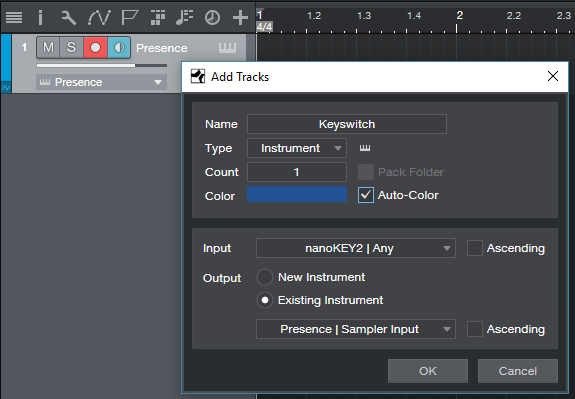 To dedicate a separate track to keyswitching, call up the Add Track menu, specify the desired input, and give it a suitable name (Fig. 2). I find it more convenient not to mix articulation notes in with the musical notes because if I cut, copy, or move a passage of notes, I may accidentally edit an articulation that wasn’t supposed to be edited. Fig. 2: Use the Add Track menu to create a track that’s dedicated to articulations. So until you have that 88-note, semi-weighted, hammer-action keyboard you’ve always dreamed about, now you have an easy way take full advantage of Presence’s built-in expressiveness—as well as any other instrument with keyswitching. If you’ve heard people talking about adding “glue” to a mix, this usually involves a bus compressor. But you can also “glue” tracks together in a subtle way by placing two standard compressors in series with high thresholds and low ratios. The result is dynamics control that’s so gentle, you won’t really hear that a compressor is working—but you will hear the benefits. As to choosing the optimum settings, this one is easy to get wrong. It’s designed for subtle effects, so keep the Input at 0.00 dB unless the incoming signal is very low or high. With an input signal that’s close to maximum, a threshold of -3.0 (as indicated by the Threshold control, because the threshold will differ for the two compressors) and a low ratio (like 1.3:1) are good starting points, with Mix set to 100%. Adjust Attack (minimum attack clamps down harder on the signal), Knee, and Release based on the input signal characteristics and desired result. Use Gain to match peaks between the bypassed and enabled states. Bypassing and enabling is a good way to hear the difference the Glue Compressor contributes to the sound. 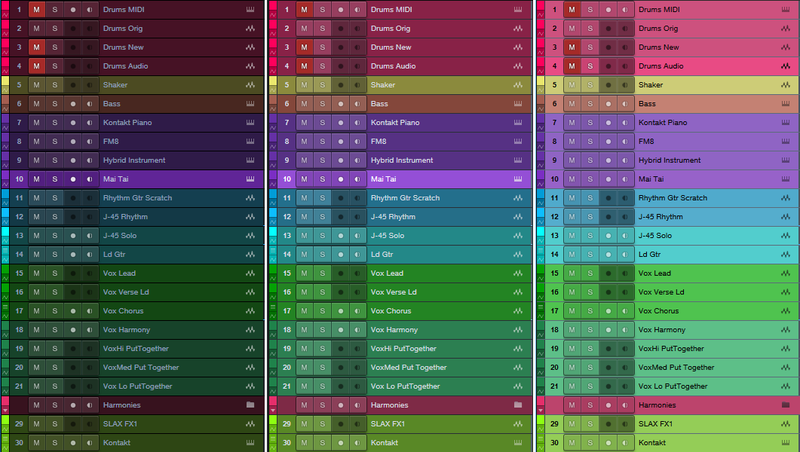 Download the FX Chain preset here. This signal processing setup is optimized for single-string guitar solos where you want a lot of sustain—but it has a secret ingredient that puts it ahead of typical guitar stompbox sustainers. The compression aspect is pretty straightforward. A sustainer is all about a high compression ratio and low threshold, which are set to 20:1 and -35 dB, respectively. The sharp knee keeps the sustain going as long as possible, and a short attack time clamps down the attack. The release time isn’t too critical, although this depends on your playing style; a relatively long one (300-500 ms) usually works best. This is one of those rare instances where you don’t want to enable the compressor’s Auto or Adaptive feature, because the goal here isn’t the most natural sound—it’s an effect. However, enable Lookahead because it helps to tame the attack. 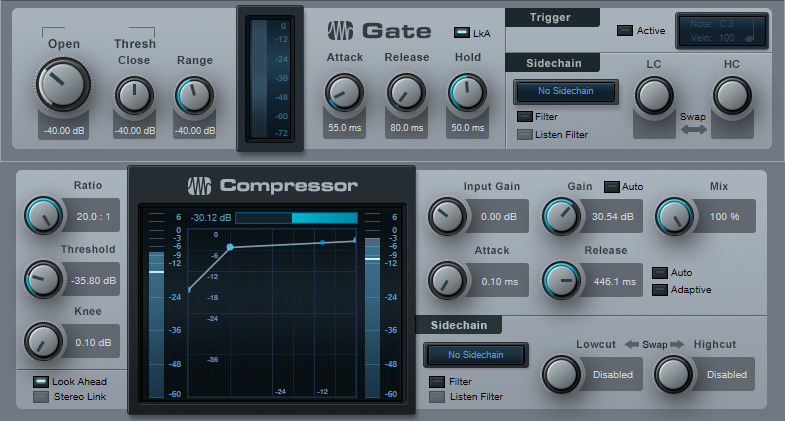 Because of the extreme amount of compression, you’ll need about 30 dB of makeup gain to compensate for the gain reduction due to compression. And now, the secret ingredient! With most sustainers, after the release time ends, if there’s a pause between notes you’ll hear a loud “pop” when you play a new note because of the compression kicking back in. A fast attack and lookahead helps, but it’s almost impossible to avoid some kind of nasty transient. 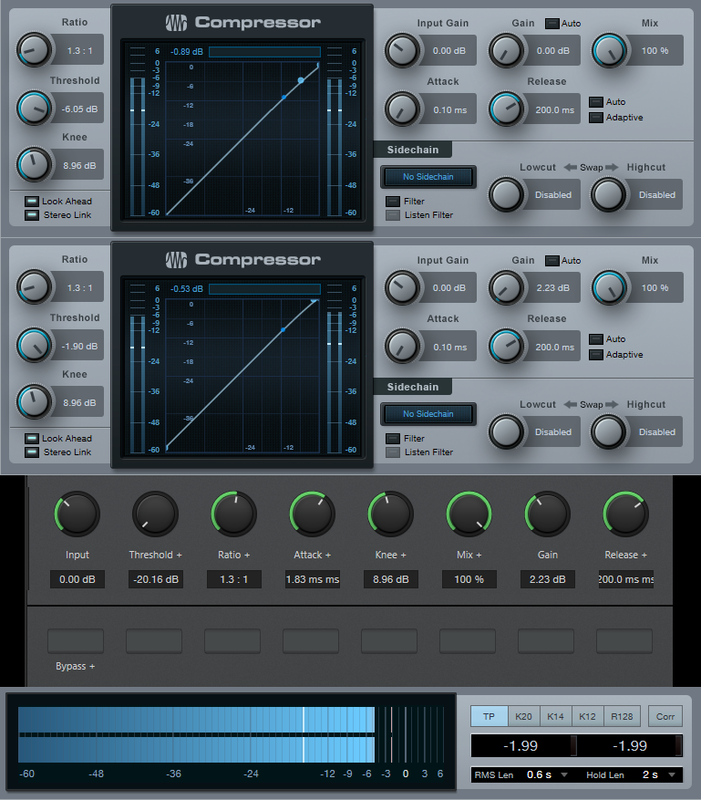 If you follow the compressor with an amp sim, the distortion will hide the pop somewhat but it can still lead to an ugly attack. Enter the noise gate. This doesn’t just remove hum, noise, and other low-level signals from being sustained, but the 55 ms attack time (coupled with the enabled lookahead button) means that when you hit a note after a pause, the note attack ramps up more slowly, so the compressor can “grab” the note without creating a pop (or if it does, the pop will be greatly reduced). If there’s an amp sim involved, you’ll hear a cleaner attack, and better overall sound. Note that depending on how fast you play and the compressor’s release time, you may need to shorten the Noise Gate’s Release and Hold times. In any event, when you want serious ssssssuuuuussssstttttaaaaaiiiiinnnnn for your single-note guitar solos, this is the ticket.